Happy 4th of July - Happy Birthday America!!!! I hope you all are able to spend this holiday with friends and family celebrating this amazing country of ours. We are very blessed to be able to be with friends who ARE family this weekend and are going to be enjoying a fun cookout, bluegrass music from the Baghdad Bad Boys (check out their website here) and of course fireworks! Our friend Greg is one of the founding members of the Baghdad Bad Boys and some of the group members will be with us all today to celebrate being HOME and being together again! 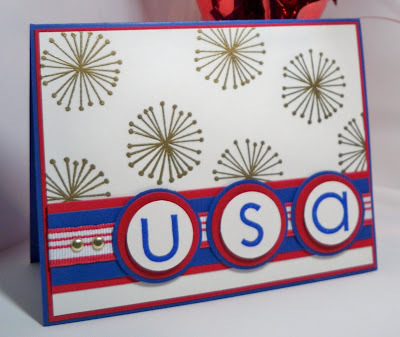 As you can see, my sketch card today for the Stamping 411 Blog celebrates the Red, White and Blue. I've started with a piece of Brilliant Blue cardstock 8 1/2 x 11 and cut it in half at 5 1/2 x 8 1/2. It's folded in the middle with my Bone Folder. The Real Red cardstock layer is cut at 4 1/8" x 5 3/8", just enough to give it a thin red line peeking out from the Shimmer White cardstock layer which is cut at 4" x 5 1/4". To create my background on the Shimmer White cardstock, I took the "sparkle" stamp from the Good Friend stamp set and inked it with Gold Encore ink, randomly stamping it several times over the cardstock. Once all the sparkles were stamped, I poured Gold Embossing Powder over the surface of the cardstock, tapping off all the excess into a Powder Pal. I then embossed this layer with my Heat Tool. For my focal point, I cut a piece of Real Red cardstock at 1 1/2" x 4 " then layered it with a piece of Brilliant Blue cardstock cut at 1 1/4" x 4". Then I took a piece of Real Red Striped Grosgrain Ribbon cut at 5 1/2" and wrapped it around the two cardstock layers, adhering it with SNAIL to the back. The two Gold Brads were added with the Handheld 1/16" Punch. I punched through the ribbon and both cardstock layers so the brad ends would be stabilized well. To create the USA, I stamped the letters from the Contempo Alphabet onto Shimmer White cardstock with Brilliant Blue ink. These were punched out with the 1" Circle Punch and layered on Real Red punched out with the 1 1/4" Circle Punch and Brilliant Blue punched out with the 1 3/8" Circle Punch. The Shimmer White layers were mounted with Stampin' Dimensionals onto the other circles and then each letter layer was mounted with Sticky Strip to the card front. If you want to play along with the Stamping 411 Operators this week, be sure to upload your card creation to the blog by using the Mr. Linky widget that is provided there. We LOVE to see your creations! If you aren't able to play this week, be sure to stop by there and see the other Operators creations as well - they are sure to inspire you!